Over the years I've taken my bike on Metrolink all across Los Angeles, Orange, and San Bernadino Counties, and the Metro Commuter Trains in Los Angeles, but have never had the chance to use Amtrak. My friend and fellow advocate for cycling, Larry Lagarde, of Ride This Bike and Places to Ride, was inspired by a story from Canada to look into the implimentation of a similar idea in the United States. He's looking for serious feedback from cyclists across the country, through blog comments here, or on his blog. service and would like to put the call out to readers at the CyclingDude. convinced that an Amtrak Bike Train would have the same results. should already be a stop on Amtrak that is staffed by Amtrak personnel. potential Bike Train service, please pass them along. Here's the story by Larry, with a link to the website of the Canadian Project. See the results of his great straw poll of some bicycle advocates from across the country in "Unboxed Bikes on Trains in the USA." Here in SoCal cyclists and everyone else, pack the Metrolink from LA to Ventura, and Amtrak to Santa Barbara, and beyond, for day trips on the weekend. I've heard it can be a madhouse, and I've heard it can be great. On trains, such as the Surfliner, you sit adjacent your bikes, but space is limited. Beginning next month I will be using both Metrolink (Pictured to the left.) and Amtrak, to get me to some rides throughout the year, and will write of my experiences. When I head out to the Northern end of the Los Angeles River to begin my ride to the beach, soon, I will have to use the Blue and Red Line Trains in LA, and on those you have to stand with your bike in designated areas of each car for the whole ride. Here is the page on the AMTRAK Website that describes its options for the cyclist. Bikes are allowed on trains at all times. Folding bikes should be folded, carried onto the train and stored like any other carry-on item. Train personnel may ask cyclists to wait for the next train if bike storage is unavailable. Three-wheeled bikes are not permitted on trains. I like the idea of having special Baggage Cars just for 50 or so bikes. Larry says that "People have been calling and emailing like crazy about the bike train. Many have asked what more they can do to help get the bike train underway." cycling helps Amtrak guage the costs and benefits of the service. support is vital. The more entities that speak up, the better. 4. Sponsor the bike train. makes it more appealing for Amtrak to initiate bike train service. to major cycling events like the Seattle to Portland Bike Classic (STP). rides put on by the Cascade Bike Club. He has more to say about the issue here. Like Larry I am very passionate about cycling. I support Larry's efforts to pursue the idea with Amtrak. Although my time and resources are limited, compared to many cycling advocates, I'm willing to do what I can to help in the effort. I often ride amtrak to Montana with my folding Bike, on Friday, from Eugene OR. as my sole source of transport. I was just in the process of planning and buying a 30 day pass for a national tour, next fall, with my husband, 11 year old, and our bikes. We can get around the issue as our bike folds but would be supportive of a bike train. With the current gas/oil situation I think bike train options will be imperative. Some train stations are more conducive to getting off and immediately riding than others. Portland is a great station and the town is excessively bike friendly, as is Eugene. I am doing research to find other Amtrak station conducive to touring right now for our trip. We have groups that love to ride from Orange County down to Solana Beach or San Diego and take Amtrak back to San Juan Capistrano or Irvine. During the past year, Amtrak has implemented a 6 bikes per train rule (two of the train cars have racks that take 3 bikes). This means that if 6 bikes board the train in San Deigo (the beginning of the line northbound), the train will take no more bikes along the way. The have been numerous times that we have ridden to Solana Beach, waited for the northbound train, and been turned away by conductor telling us "train can take no more bikes". I hope Amtrak changes this policy! We can no longer ride south with any confidence that we will be able to get home. 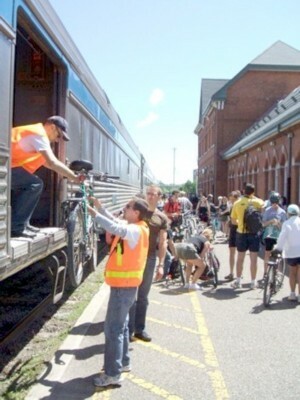 The Bike Train is not an official VIARail Train but rather a private operator with support from VIARail. The Bike Train has been expanded to serve the Toronto-Montreal and Toronto-Windsor corridors. In August 2008, I wrote a "Comment" for the New York State Rail Plan. Almost none of my suggestions were even acknowledged by the NYS DOT for inclusion in the Plan. Commuter lines around New York City, including New Jersey Transit trains have a similar policy in regard to bicycle carriage. The big exception is that you can sit down after securing your bicycle to the wall or cleats on the train. The area reserved for bicycles is the are used for wheelchairs and disabled individuals. WRITE to your State legislators & to your US legislators (Senators & Representatives). You will need at least 100 people to hand write (with email follow ups not the other way around) a letter with details of what the policy should be. We had a great time putting our bikes (unboxed) on a train from Glascow, Scotland up to Inverness and then out to Highlands, where we then biked to the coast and beyond. The bikes were in the baggage car, which was 1/2 of a coach, and we were in the other half. We then boarded later in another town for the ride back to Glascow. bikes and then biked off into the countryside. Amtrak stops in Columbus, Wisconsin where the quiet roads and gorgeous scenery with rolling countryside is perfect biking country. I am starting a campaign to change Amtrak's policies about, and service levels for, cyclists (Train Bike Travel Now-USA or TBTN-USA). Currently, Amtrak restricts boarding of bicycles on certain trains that can accept bicycles, to selected stations. And as we all know, Amtrak will not accept bicycles on all trains. Amtrak also has distinctly travel-planning unfriendly reservation practices about bicycles. For example, on Amtrak's Boston-Portland service, cyclists can only get on at Boston, Portland and only one of the eight intermediate stations. They obviously do not restrict wheelchair boarding to only of the intermediate stations. I am not aware how this policy was developed, but it would seem to me that a cyclist can board with his bicycle faster than most wheelchair-bound passengers can board, and if they are not restricted to certain stations, I fail to see the logic in restricting cyclists boarding at any stations. Not all trains will accept bicycles. Yet all trains accept handicapped passengers of all varieties. Its time Amtrak realized they are missing revenues and impeding "green travel" by unnecessary restrictions on cyclists. Amtrak's loading options are also cumbersome. The best system I have seen was on the Nantucket, MA ferries, which can load or unload 10 bicycles safely and with zero damage in under one minute. (the bikes are hung by their rear wheels from a cart which hangs 8 or 10 bicycles safely spaced to not damage one another. The cart is rolled on/off in seconds. Amtrak should give up its boxes, the requirement for cyclists to travel with pedal wrenches and eliminate the cardboard waste, shifting to carts. Where there is no baggage car, bikes can be safely stowed in unused wheelchair positions and in vestibules at traincar ends. If that space is filled up, then its time to build Euro-style, cars designed to accommodate 2/3 passenger/ 1/3 bike cart area coaches. Reservation and cancellation policies are also a problem. Bike boxes at stations cannot be reserved, but are required for travel and may or may not be available. Baggage cars may be canceled for mechanical problems, with no accommodation/help to cyclists, whose vacation plans could be wrecked by Amtrak's sudden inability to handle their bicycle. The actual process of making a bicycle space reservation requires phone conversations, because the Amtrak web reservation capability was not really designed to serve bicyclists needs. Bottomline, Amtrak is leaving money on the table by not providing adequate services to cyclo-travelers. Please consider supporting Train Bike Travel Now (TBTN-USA). Let's help bring Amtrak into the age of green cyclo-tourism.